Target for Tonight is a World War II documentary detailing night RAF bombing missions into Germany with British Wellington medium bombers. 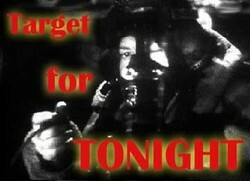 Target for Tonight follows the crew 'F for Freddie', a Vickers Wellington medium bomber (Millerton Station, Group 33), through an entire low-level night mission attacking an oil storage depot at a rail yard.. Notice how the film highlights the participation of not only servicemen from all classes from around the British Isles, but also Canadians and a navigator that sounds a lot like an American RAF volunteer.The film exemplifies the understatement, dry humor, and 'business as usual' approach typical of British information films of the period, along with a clear 'get the job done' attitude. A 50-page Vickers Wellington pilot's manual is included on the DVD. It is in .pdf file format with photos, systems diagrams, performance charts, procedures & more. Covers Wellington III, X, Xi, XII, XIII, & XIV. The manual can be accessed on a computer equipped with a DVD drive. The DVD is in B+W with a run time of about 50 minutes.